As the 2030 Sustainable Development Goals were adopted at the 70th UN General Assembly, they became the common goals that international community seeks to achieve together. UNESCO has also been trying to connect the culture and sustainable development, especially since the 2003 Convention emphasizes the importance of intangible cultural heritage as a guarantee of sustainable development. 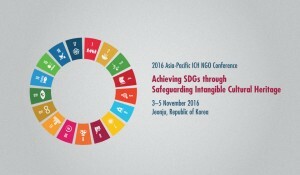 The aims of the 2016 Asia-Pacific ICH NGO Conference are to better understand the relationship between intangible cultural heritage and sustainable development, to empower ICH NGOs in the region through sharing useful information on their activities, and to strengthen NGO networks in the region. Many ICH NGOs, based on their experience and specialties, conduct activities related to sustainable development, such as poverty alleviation, community empowerment, urban renewal, education, and so on. As NGOs are mediators bridging between governments and communities, it is important to share their activities and build a network for vitalizing their ICH safeguarding activities for the sustainable development of humanity. ICHCAP is looking for ICH NGOs in the Asia-Pacific region who are willing to share their activities at this conference. The applications will be accepted from leaders and activists belong to an NGO in the field of ICH or culture in general, whose activities are in related to the conference topics outlined in the next section. – Selected participants will be provided accommodations, meals, local transportation, and field visits in Korea during the official program. – The international flights to Korea and other expenses for traveling should be covered solely by the participants. I am interested to participate in intangible heritage conference to be held on seoul 2016. Please read the HOW TO APPLY section ( in this post ) in order to contact ICHCAP. GLAD TO KNOW ABOUT THE ICHNGO FORUM CONFERENCE SCHEDULED ON 3-5 NOVEMBER 2016 AT JEONJU REPUBLIC OF kOREA . IN FACT, I WISH TO PARTICIPATE IN THE CONFERENCE AND CONTRIBUTE PAPER . I CAME ACROSS THE INFORMATION LITTLE LATE AND COULD NOT FOLLOW DEADLINE OF SUBMISSION. SECONDLY, I WAS PREPARING MYSELF FOR THE 11TH SESSION OF THE CONVENTION OF INTERGOVERNMENTAL COMMITTEE SCHEDULED AT ADDIS ABABA ETHIOPIA FROM 28 NOV. TO 4TH DECEMBER 2016; AND A DAY EARLIER ON 27TH MEETING OF THE FORUM.. UNDER SUCH CIRCUMSTANCE IT SEEMS DIFFICULT FOR ME TO COMPLY WITH YOUR IMPORTANT EVENT. PLEASE SUGGEST ME THE WAY OUT.